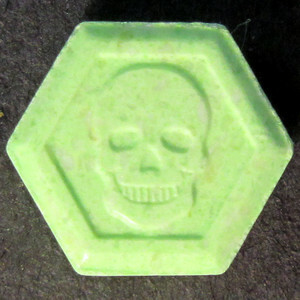 Green hexagonal Philipp Plein tablet with skull on back. 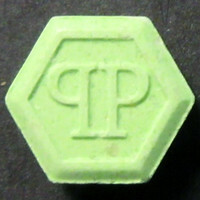 No break line. EcstasyData is not allowed to provide quantitative results for samples it analyzes (and inactive binders, coloring, diluents, and cuts can not be reported even if they might be present). The lab we contract with is constrained by rules set by the US DEA. The European groups whose results EcstasyData re-publishes are not similarly constrained.